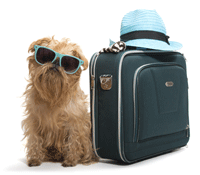 when packing a suitcase for your pets! Where can I take my pet abroad? There is a list of European Union countries that allow the movement of animals in and out on the government website www.gov.uk/take-pet-abroad. Pets must have a Pet Passport to travel. There are one or two countries which have added conditions to pets’ freedom to travel. Then there is a list of other countries outside the EU who are considered not to be a rabies risk, who are also able to issue Pet Passports. Some of the participating countries place restrictions on the breeds of dog they will allow to cross their borders. Finally there is also a list of countries outside the EU where a third country certificate can be issued to allow pets to travel. This is much more restricted and it depends on the country’s rabies status as to whether a blood test confirming rabies immunity is required. If in doubt as to what you require when taking your pet abroad, always check with DEFRA. Your vet will also be able to advise you on specific requirements for your pet’s travel. How do I obtain a Pet Passport for taking my pet abroad? 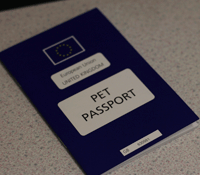 The rules for the Pet Travel Scheme (PETS) were simplified in 2012, so passports are easily obtained, but it’s important to follow the correct order of procedures to gain the passport. It is also important to check whether the country you’re travelling to has any additional requirements. If you have more than 5 pets, you will need additional certificates to travel. The first step in getting a passport is having your pet microchipped so that it is easily and reliably identified. The microchip is a small inert device slightly bigger than a grain of rice. It carries a unique number that is read by a handheld scanner when passed over the microchip. Usually the chip is placed under the skin between the shoulder blades. Once your pet is microchipped, it’s sensible to ask your vet to check it each time you visit the surgery to make sure it is still easily read; thankfully problems with microchips are very rare. Once your pet is microchipped, they need to be given a rabies vaccination. It is essential that the microchip is implanted before the rabies vaccine is given; ensuring that your pet is identified before vaccination. A rabies vaccine given prior to microchip insertion is invalid. Any vet is able to administer the rabies vaccine after checking the microchip identification, however, only Official Veterinarians are able to sign and stamp the passport to confirm a rabies vaccination has been given. Do check that your veterinary practice has an Official Veterinarian able to do this – DEFRA will be able to tell you where to find an Official Vet if your practice doesn’t have one. Then the vet will apply their official stamp to the rabies vaccination entry and sign the passport. Once the passport is completed, you will be issued with it and asked to check that your details and your pets’ details are correct. Now your pet is almost ready to travel. You just have to wait 21 days from the date of the rabies vaccination before taking your pet abroad. What methods of travel can I use to take my pet abroad? Pets can travel within the EU with a pet passport by air, sea, or rail but there are rules for their travel. If you’re using a travel company, they may be able to offer guidance on transporting your pets, but you could also check the approved air, sea or rail travel routes via the government website. Your pet will also need an approved carrier for many of the modes of transport – again, check in advance of travelling what the requirements are. When you’ve chosen a holiday destination, don’t forget to confirm any other conditions that country has, beyond the Pet Passport. For example, dogs coming into the UK, or returning to the UK, are required to have tapeworm treatment between 1 and 5 days before entering the UK. This treatment needs to be recorded in the Pet Passport by a vet. So you will need to find a vet in the country you’re visiting to fulfil this requirement before returning home. This raises another important point. We’d recommend that you cover your animal with anti-parasitic treatments before travel to try and avoid the risk that they pick up unwanted passengers whilst you’re abroad. There are diseases in some European countries that are not native to the UK, and some of them are spread by parasites. For example, tick borne diseases such as babesiosis and ehrlichiosis, or leishmania which is transmitted by sandflies, or heartworm which is spread by mosquitoes. These and other diseases found in other countries are potentially fatal. When you know where you’d like to take your pet abroad, ask your vet about optimal anti-parasitic treatment for your pets. Should your animal fall ill once you return home it’s very important to let your vet know that they’ve been abroad. Finally, if your pet is insured, it’s worth checking that your policy covers them for illness whilst they’re abroad to give you peace of mind. There is a helpful website produced by the government department DEFRA, which we’d strongly advise you check to gain more information about taking your pet abroad. The web address for that site is www.gov.uk/take-pet-abroad. Alternatively you can phone them on the PETS helpline on: 0870 241 1710. So, we’ve covered the basics of what you need to do if you’re thinking about taking your pet abroad. For anyone that is considering emigrating, there are some excellent companies out there who specialise in the intricacies of pet export, and we’d recommend you seek them for help as it can be a complicated process. 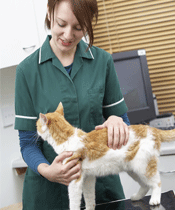 Remember to consult your vet who will be able to help with your pet’s health requirements. Happy travelling! Further information on changes to the EU Pet Travel Scheme effective from 29/12/14 can be found on the government website.